It is a feature rich lightning generation tool that allows you to create a bolt of lightning of any shape and color. To change the bolt position and orientation, left click and drag its start and end points in the view window. These points are marked with blinking squares that appear only if the lightning animation is selected in the animations list. This tab contains the basic controls for the object geometry. Seed - selects the sets of parameters for the lightning shape. Toggling the button with the die activates random mode where the shape of the lightning is always unique. Width - sets the start width of the lightning bolt. Detail - sets the level of detail that determines number of segments used to draw the lightning. Tortuosity - sets the deviation of the bolt from a straight line. Higher values make it more folded. 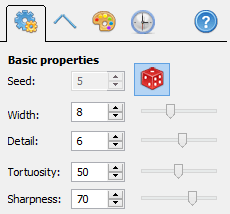 Sharpness - sets the width of the lightning ends as a percentage of the start width. This tab contains controls for the lightning branches. Length - sets the maximal length of the branches. Deviation - sets the maximal angle between a branch and its parent stem. 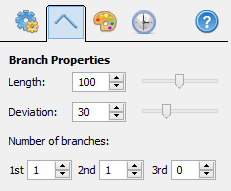 Number of branches - sets the number of branches of each level. 1st level branches stem from the main bolt. 2nd level branches stem from 1st level ones. And so on. This tab contains controls for the color of the bolt and its glow. Glow opacity - sets the strength of the glow effect. 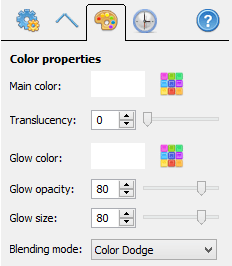 Glow size - sets the width of the glow. 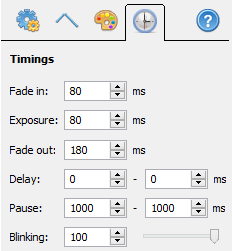 Fade in - sets the duration of initial lightning growth. Fade out - set the duration of lightning fade. Delay - sets the minimal and maximal delay before the Fade in phase. Pause - sets the minimal and maximal pause after Fade out phase. Blinking - sets the intensity of the blinking effect during the Exposure.